A gathering of Embro-area recruits who were at the Oxford Rifles’ Thames Valley Camp, from Sept. 16-27, 1940. Front row, from left: Byrnes Fleuty, John Whittaker, Charles Beagley, Dallas McCorquodale, Ron Ward and Harry Masters. 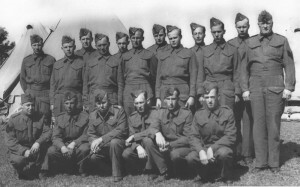 Middle row, from left: Art Hammond, Art Karn, Hugh McKay, Ken Collins, Lorne Dundas and Ernie Ward. Back row, from left: Scott Robinson, Charles Munro, Bob Munro, Russell Wood, Gord Yake and Bill Sutherland.